Can you identify where in London this picture was taken? If you think you can, leave a comment below. We’ll reveal the answer next week. Good luck! This bronze sculpture is indeed located in Spitalfields. 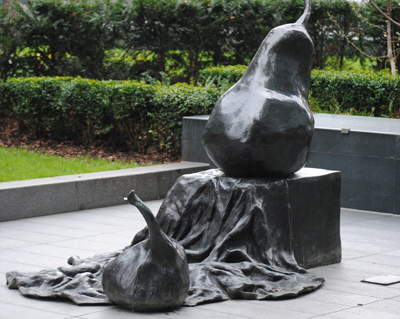 Named A Pear and A Fig, the still life was created by Ali Grant in 2006 and installed in Bishops Square just outside the western end of Spitalfields Market. There’s a suggestion it has been moved – we’ll endeavour to confirm that! Just outside one of the Spitalfields Market entrances. I think that was somewhere around Spitalfields market, but I also thought it was temporary, so it may have moved on.